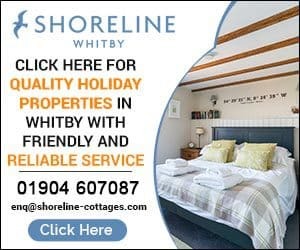 We all know there are a great many reasons why you should visit the quaint town of Whitby. Breathtaking views, abundant history and delicious fish and chips being just a few of them. There are however, also some real hidden gems (pardon the pun) in Whitby and they are just waiting for you to discover them! Jet is a semi-precious stone of the deepest black that is created as the result of a complex chemical process. The finest examples of it are to be found in Whitby. For thousands of years personal adornments such as beads, buttons, earrings, bracelets and rings have been conceived, produced and sold in this town. 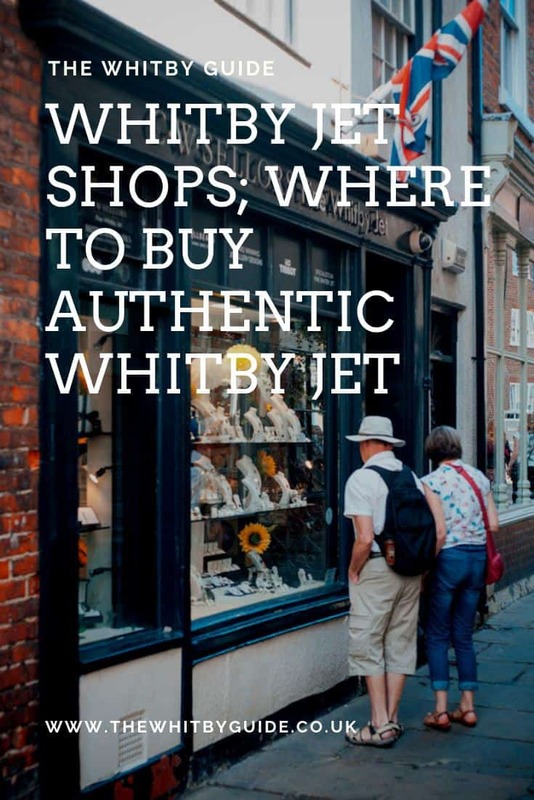 You will find many stores in Whitby displaying beautiful pieces such as jet jewellery and figurines. The difficult decision is not whether to buy some, but where to buy it from! 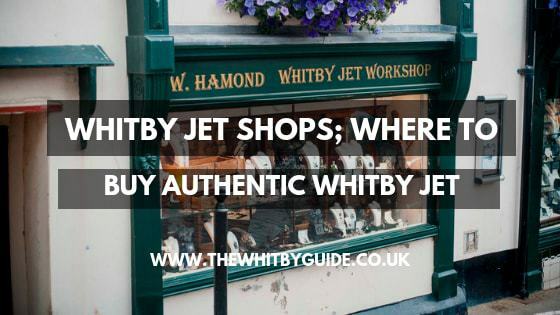 The following will help you, it is a guide to the best jet retailers Whitby has to offer. 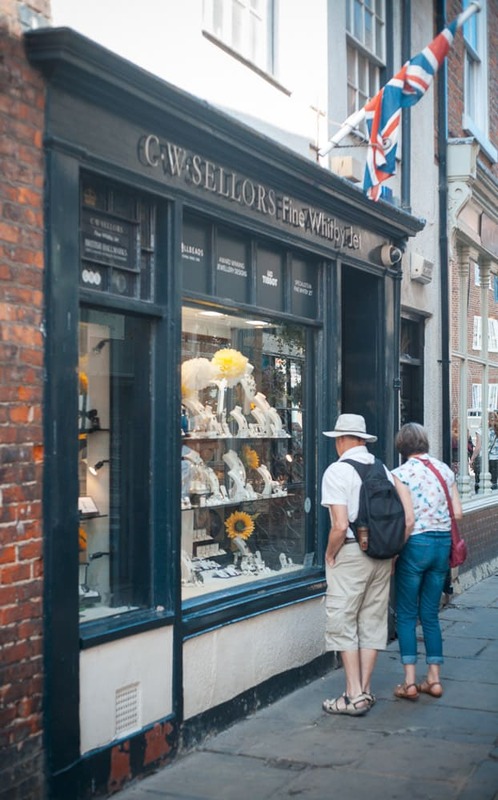 This whimsical jewellery boutique and workshop is situated on the cobbled street at the bottom of the Abbey’s one hundred and ninety-nine steps. It has been welcoming visitors since 1860. Known locally as a Victorian treasure W Hamond is a big part of the town’s heritage with Queen Victoria being a patron during her rule. Craftsmen there still combine age-old techniques with modern technology when working with the jet. As a business they come highly recommended with their excellent customer service and expert advice. The services they provide not only include the sale of fine Whitby jet pieces but also the designing, repairing, cleaning and the valuing of pieces. As well as offering modern made classic and contemporary jewellery pieces W Hamond also has a collection of antique jet for sale. These beautiful historic necklaces and bracelets really are quite exquisite and definitely worth investing in. 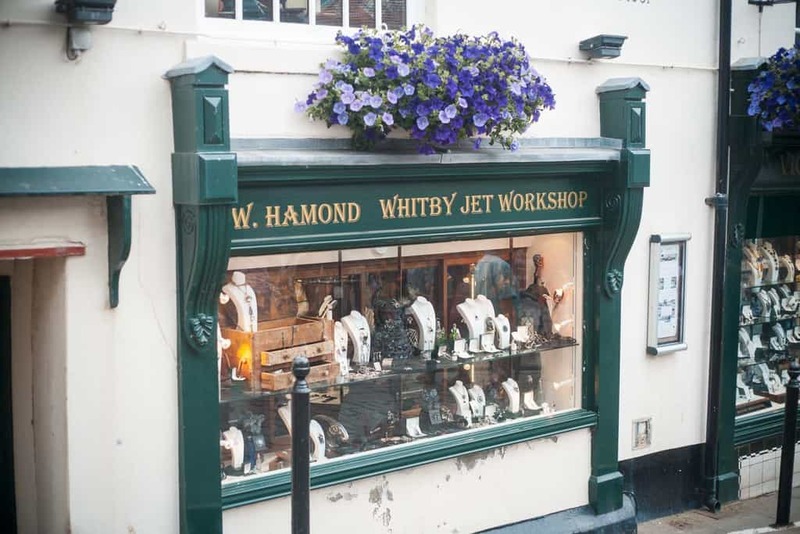 W Hamond is located at 112 Church, Whitby and opens 8.30 am – 6 pm Monday to Saturday. Sunday is 10 am – 5 pm. The proprietor of One O’ Five Kevin Dixon is reputed to be one of the finest jet carvers in Whitby. He is regularly to be found collecting his own pieces of this stone along the coastline. If you are lucky enough, you may also see him hand carving items in his shop. Kevin specialises in creating jewellery, figurines and gothic items such as crosses, skulls and bats. Ideal pieces to purchase, especially if you are planning on attending one of the two annual goth weekends. 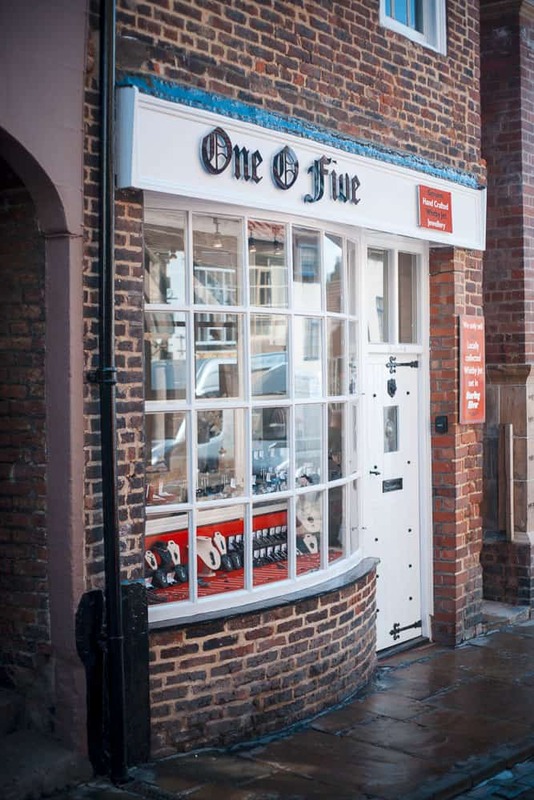 One O’ Five is situated at 105 Church Street, Whitby and opens 11 am – 5 pm seven days a week. Ebor Jetworks is a 17th century workshop that not only designs but also handcrafts all of its jewellery pieces. Owned by David who is a skilled craftsman of ten years, and Sarah Steele, who is the only gemologist in Whitby, it offers contemporary and interesting pieces. The jet that Ebor Jetworks uses is collected from the local beaches. They run a demonstration six days a week at which you can watch them polishing it. All the charm of Whitby jet is in its highly polished finish. There are various different collections available here including British Icons which contains pieces displaying crowns, hearts and flags. The Sarah Steele collection uses other stones such as fordite, turquoise and goldstone to accentuate the jets beauty. Ebor also offers a range of giftware that includes thimbles, keyrings, cocktail swizzlers, money clips and more. 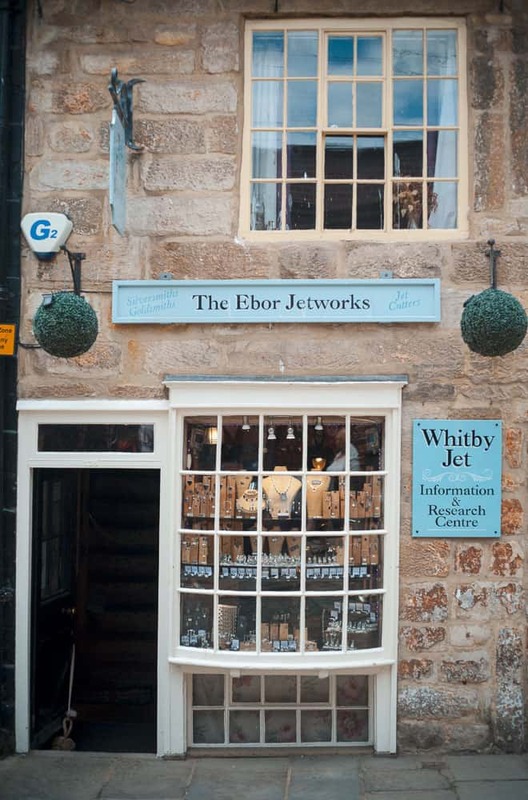 Ebor Jetworks is situated at 138 Church Street, Whitby and opens 10.30 am – 6 pm seven days a week. The jet used by C W Sellors is sourced from a two mile stretch of the North East Yorkshire coastline. Each stone is then selected by hand for individual pieces and cut and polished to perfection. Once the stones are ready they are made into jewellery items such as rings, earrings, bracelets, bangles, necklaces and cufflinks. They also make fabulous four piece gift sets that include a bracelet, necklace, earrings and ring all designed to match. Their workshop also makes use of gold, rose gold, white gold, amber, mother-of-pearl, marcasite, ruby and bauxite in its designs. C W Sellors is located at 7 Sandgate, Whitby and opens 9 am – 5.30 pm every day. Heritage Jet is unique amongst all the Whitby jet stockists in that it has an original workshop that was registered in the 1867 White’s Industrial Directory of North Yorkshire. Just one of 200 similar listed workshops in Whitby it was discovered in the attic of a derelict building. The finding of this Victorian workshop was of great historic importance as it is a primary source of evidence relating to Whitby jet. Written records of the industry and its technologies do not really exist since most of the workers involved could neither read nor write. Carefully removed and set up in Heritage Jet’s premises it is now used to show groups of tourists and school children the Victorian jet industry. These workshops include a 20 minute talk and tour for school children and a more in depth talk and tour for adults. Regarding the creation and stocking of Whitby jet pieces Heritage sources all their stones from an eight mile stretch of beach. Every piece they produce comes with a certificate of authenticity. They also specialise in Victorian jet jewellery restoration. 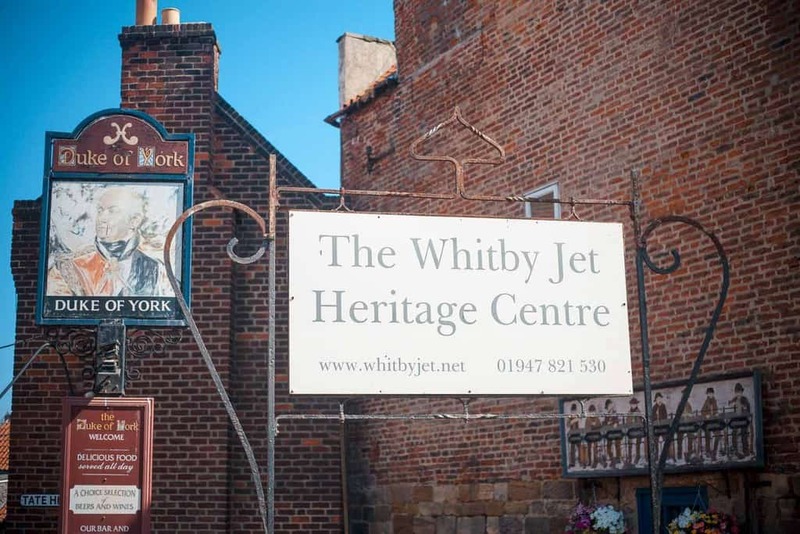 Heritage Jet is situated at 123B Church Street, Whitby and opens 10.30 am – 4.30pm every day of the week. This family business has been running for over thirty years and has its own local workshop. Pieces they create are handcrafted and unique using locally sourced jet. Pendants, earrings, ear studs, bangles, bracelets, rings, cufflinks and matching gift sets are amongst the quality pieces that Simpson produce. They also materials such as gold and amber to enhance their work. 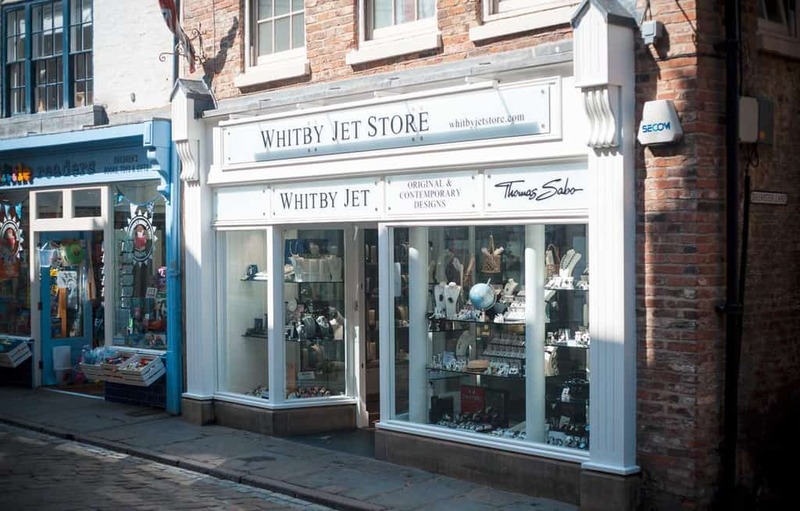 Simpson Jet Jewellery Of Whitby can be located at 21 Grape Lane, Whitby and opens 9.30 am – 5 pm seven days a week. Monkey puzzle gems opened in February 2010 and has a workshop on Whitby’s West Cliff. They produce and sell many one off unique pieces with the jet used collected locally. Sterling silver is used in most of their designs with Baltic amber, opal and turquoise all being incorporated into some designs. They also design pieces which use ammonite fossil and vintage shell cameo inlays. 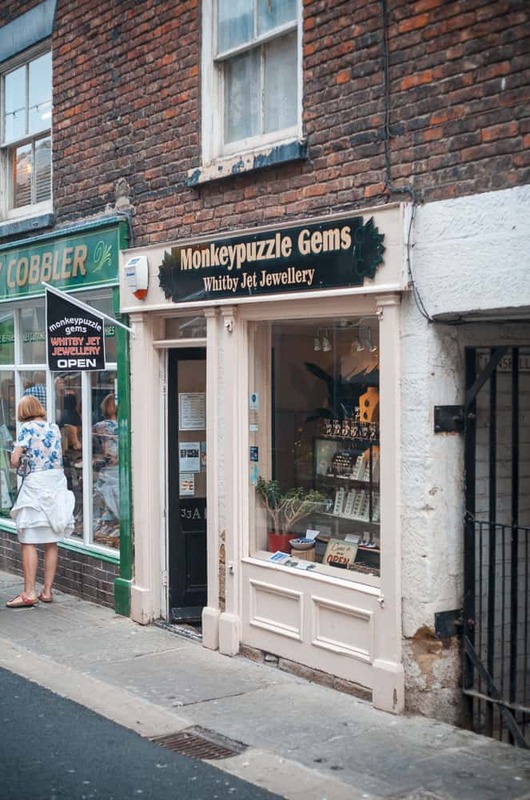 Monkey Puzzle Gems is situated at 33 Baxtergate, Whitby and opens 10 am – 5 pm Tuesday to Saturday. Youngs Jewellery was founded in 1983 by Anne Young and later purchased from her by the three proteges she employed. All three, Cathryn Pink, Nadine Elliot-Parkinson and Sandra Pearson are highly qualified designers and producers of Whitby jet jewellery in their own right. 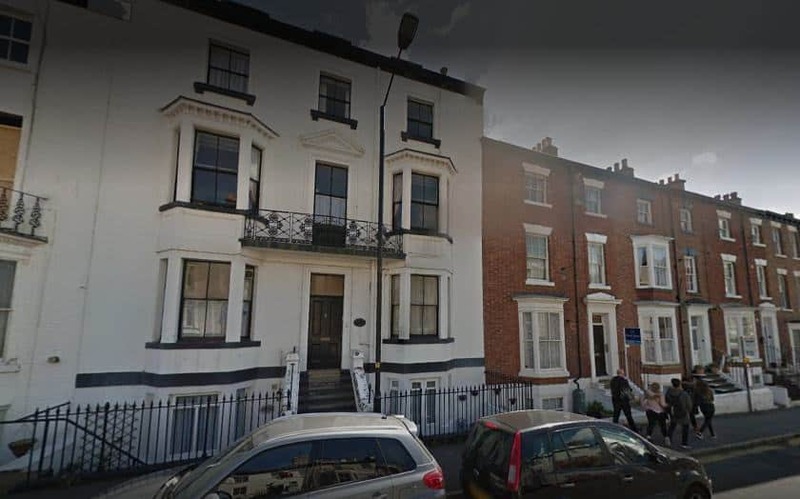 Since purchasing the jewellers the three ladies have maintained the vision of Anne Young and continued with the Whitby and sealife themes she loved. Beautiful starfish, crabs, ammonite and shell designs adorn some beautiful pieces. Whitby designs include the endeavour pendant with jet that celebrates the connections of the town with the famous Captain Cook. He, of course, lodged in Whitby when he was a trainee for a large shipping firm. The Caedmon cross also features in Youngs jewellery designs. Displaying the figures of Christ, David, St Hilda and Caedmon the original can be found towering over Whitby on the East Cliff. 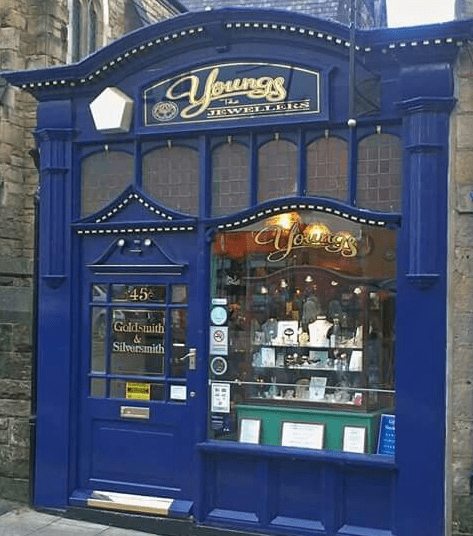 Youngs Jewellers can be found at 45 Skinner Street, Whitby. Their opening hours are Monday to Saturday 9.15 am – 4.45 pm. Animus is from the latin for spirit, mind, intention, purpose, courage, passion and soul. It is also linked to the Junglian philosophy and refers to masculinity with femininity. These concepts are the basis for Animus jewellers. Founded in 2016 by Aaron Bosanko, Animus believe that jet appears as a very masculine gem with its intense black darkness. Yet, most jet jewellery is aimed at the female market! This is totally in opposition to the light, fairy pink colouring so often associated with ladies wear in this arena. Aaron has over a decade of experience in working with jet and produces the finest, contemporary jewellery. He also takes commisions. Animus Jewellery is online only but to view Aaran’s work you could visit Jet Black Jewellery in Robin Hoods Bay at the New Road address. Gouldbuys specialises in antique jet jewellery that has been purchased predominantly from private collections. Sourced from family vaults pieces are mainly heirlooms and guaranteed to only be of the finest quality. Over a large period of time Whitby jet has been used to produce extremely high end pieces of jewellery. Queen Victoria had a love of Whitby jet using it in pieces she wore in remembrance of her husband Albert. Other fans were the Queen of Bavaria and the Empress of France. Founded in 1983, this family run business also offer repairs, restoration and valuations as well as buying and selling of quality pieces. 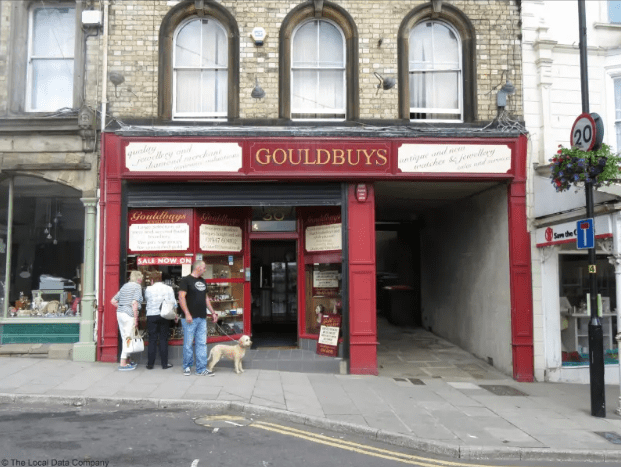 Gouldbuys Jewellers is located at 30 Flowergate, Whitby. Robinsons has been making quality Whitby jet jewellery for over twenty years. When they are able to they collect their own jet, but are also known to buy from experienced local collectors. All pieces made by Robinsons are high quality and made to last a lifetime. Items they sell include earrings, pendants, brooches, bracelets and jewellery sets. They also make mens cuff-links and tie pins. 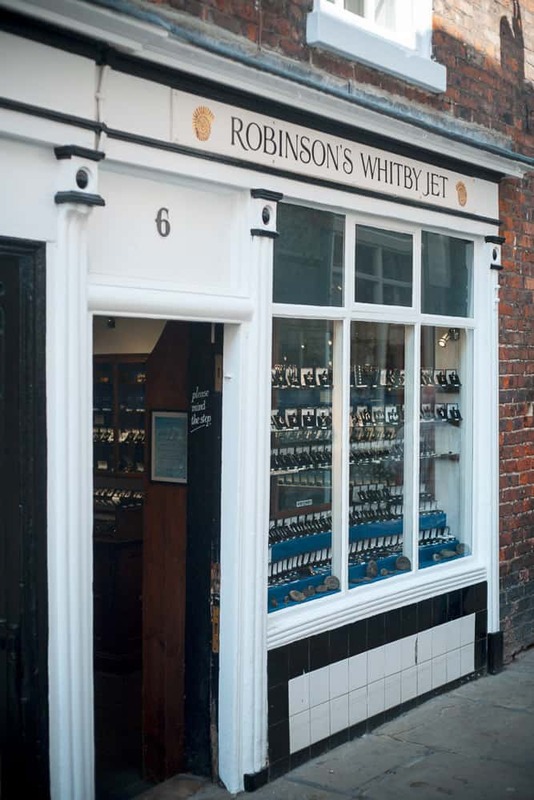 Robinsons Whitby Jet is situated at 6 Sandgate, Whitby and open from 10 am – 5.30 pm seven days a week. Loving these Whitby Jet Shops? Pin them!